 Tank trailer truck (Magirus S 3500) "Rheinpreussen"
Tank trailer truck (Magirus S 3500) "Rheinpreussen"
Tank trailer truck (Magirus S 3500) 'Rheinpreussen', 1958. Tractor unit: driver's cab with chassis, tow hook and wheel rims mint green. Interior with seat and steering wheel anthracite grey. Fifth wheel plate silver. Grille traffic red with silver-painted ornamental frame and Magirus logo. Headlamps and side signal orange indicators painted by hand. Driver's cab doors with round Rheinpreussen logo in white, black and mint green with silver door handles. Roof surface painted white. 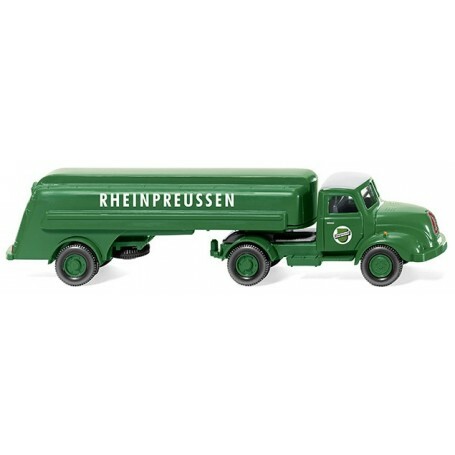 Semi-trailer with tanker upper and lower part and fenders, axle mounting and wheel rims mint green. 'Rheinpreussen' side lettering in white. Round Rheinpreussen logo on rear and carmine red tail lights.